BERYL is a renowned manufacturer of aluminum electrolytic capacitors, positioned in Zhaoging, China. Its models are famous worldwide with its high quality and long life. The company invests in new technologies and innovations in order to supply competitive products. The main features of BERYL capacitors are small and compact size, high temperature durability and long working cycle. They are used in many types of products such as energy-saving lamps and bulbs, telecommunication systems and devices, medical equipment, UPS power supplies, speakers and amplifiers and many others. BERYL stands for quality standards and competitive prices. Electrolytic capacitor 1uF, 25V, THT, Ф5x12mm Electrolytic capacitor with an operating voltage of 25 V, 1 uF nominal capacity and operating temperature 105 °C. List Price: 0.05лв. VAT Incl. 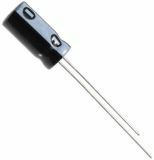 Electrolytic capacitor 2.2uF, 50V, THT, Ф5x12mm Electrolytic capacitor with an operating voltage of 50 V, 2.2 uF nominal capacity and operating temperature 105 °C. Electrolytic capacitor 1uF, 50V, THT, Ф5x12mm Electrolytic capacitor with an operating voltage of 50 V, 1 uF nominal capacity and operating temperature 105 °C.